I didn’t have a gaming-worthy PC until relatively late in my gaming life. And even once I did, I really didn’t have any pocket money to pick up the must-have titles. So I didn’t have them. As a result, I missed out on some of the great games that should have shaped my view of what great games are. 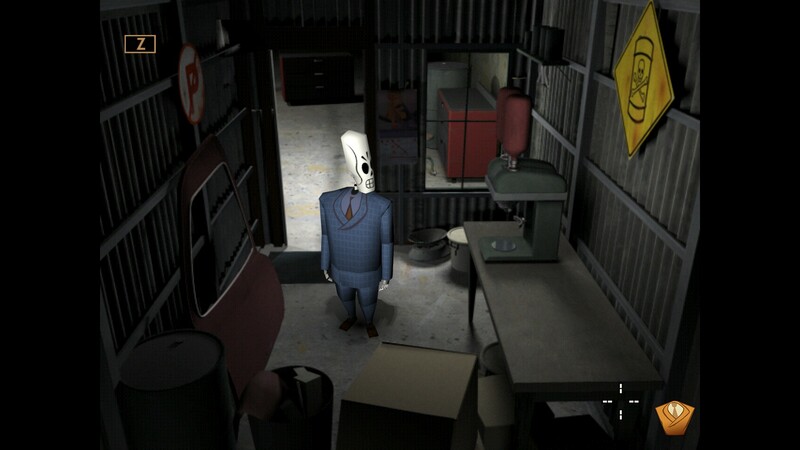 Included on that list is Grim Fandango, one of the legendary adventure games from LucasArts and the folks who would become Double Fine. Thus, I might be one of the few people reviewing this title who is experiencing it for the first time. With a name like “Remastered” you could be excused for expecting this game to have all new, high resolution art assets. It doesn’t. Most of the artwork is the very same stuff that was included in the original game. This means you can expect to see some extremely low poly models and lots of high-poly low-res pre-renders. That’s not to say that no work has been done to improve how the game looks. To get an idea of what the remastering has done you need only pull up the options menu and switch between the new renderer and the original one. In the old days there was clearly a maximum precision and resolution that was achievable, and nowadays the models will render just as crisp and as smooth as your PC resolution will allow. You can also choose to go with a 16:9 display or a 4:3, but I stuck with the original 4:3 for the most part. So now that we know that the visuals are much as they were in the past, just how good are they? Well, pretty good. As I said, the backgrounds and cinematics were pre-rendered, so they are a good deal closer to what you’d expect from a modern game than a game from this era. And the art style has all of the charm and originality that people loved when it first game out. The world is a jazz-era art-deco wonderland wrapped in semi-hellish/semi-whimsical ideas of what the afterlife might hold. 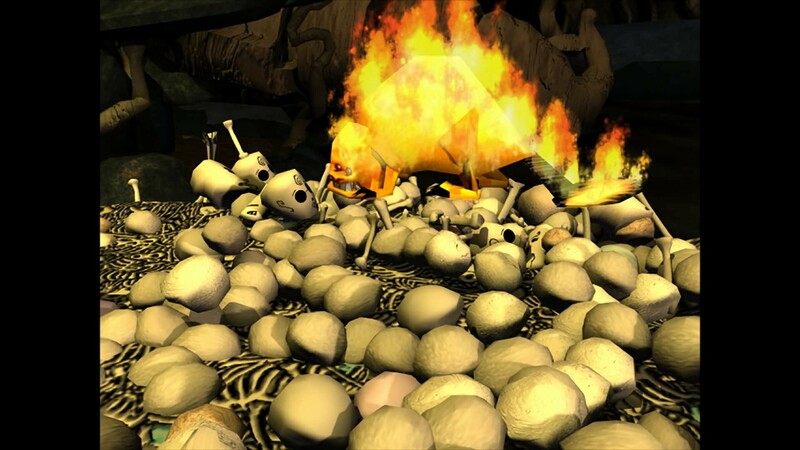 Most characters are either skeletons depicted in a snappily dressed “Dia De Los Muertes” style. Mouths are textures that animate, and despite having no flesh, body types range from morbidly overweight (somehow) to strangely attractive. They obligatory empty eye sockets and permanent grin are accented with lines and patterns that make each character distinctive and easily recognizable. You’re a loose cannon, Manny! 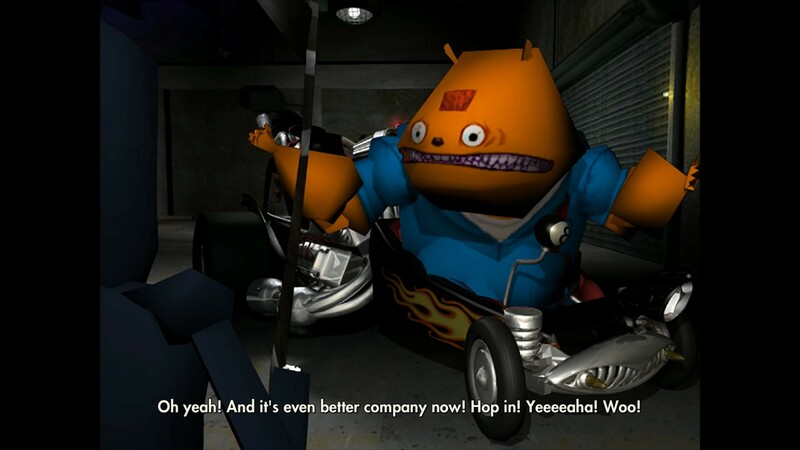 In addition to the skeletons, there are demons like Glottis who have wildly divergent body types and designs, adhering pretty much to whatever the artists felt a “demon designed solely for driving” or such might look like. (Hint, think Ed “Big Daddy” Roth). All in all the charm and creativity goes a long way to glossing over the 15+ year old visuals. 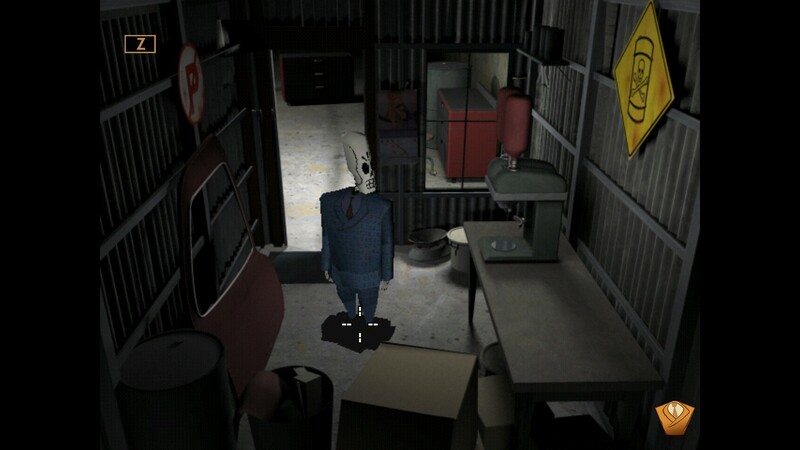 This is an adventure game, and as such you should probably already know how it works. 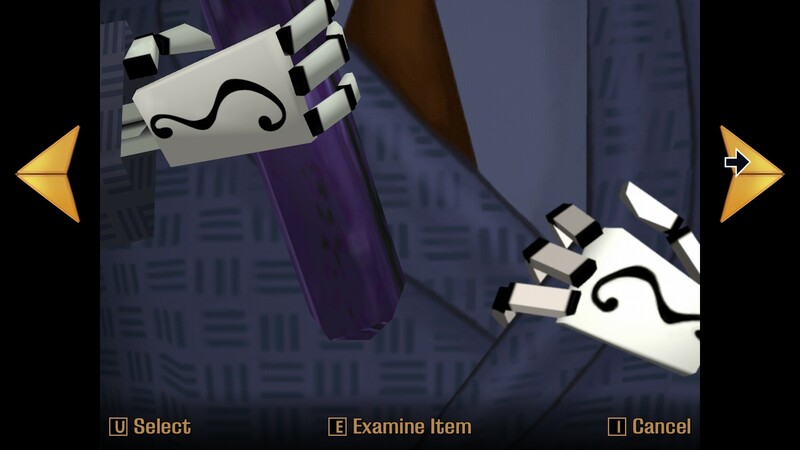 You search the environment for inventory items and interactive objects, then you use them together to solve puzzles creatively. Now, this was a revolutionary step into 3D adventuring when it was first released, so to modern gamers this will serve as something of a missing link between the 2D point and click days and the more recent Telltale-style adventures. Among other things, this closer link to the origins of adventure games means that many of those little aids that we’ve come to rely upon in recent years are not present. Don’t feel around for a button to reveal all hotspots. Instead you’ll have to sweep the screen with your pointer like you did in the past. There’s no hint system either, and no auto-save. No one is going to remind you what puzzle you’re supposed to be solving. It is all up to you. Layered on top of this utter lack of helping hands is the absolutely bizarre nature of the puzzles. The most obvious solution to a problem rarely has any resemblance to what you actually need to do to progress. Even if your adventure game logic is perfectly sound, you’ll be doing quite a bit of trial and error to get past things like flaming beavers who want to build a dam from your bones or finding a way to get your boss to sign your work order. Then, just when you are resigned to applying 2 + 2 = 5 logic to every problem, the obvious answer is the one that works. It is maddening. Whether or not it is maddening in a good way is largely up to you. I should point out here that the lack of an autosave didn’t become a problem until I encountered one or two crashes. As I was both working with a pre-release version at the time and am reviewing on a machine that’s seen better days, I won’t take points off, but you should be mindful of this in case it turns out to be a problem for you. The vocal performances in this game are really excellent. Every bit as full of character and personality as the visuals. We already know that LucasArts was capable of crafting stories and settings worthy of being their own animated series, and the vocalizations continue that. From Manny’s calm, clever delivery to Glottis’ over the top, manic bellows, every performance is perfectly suited to the personality, the appearance, and the role of each character. The music is excellent too, but I didn’t really come to appreciate it until I started paying attention to the other significant audio addition. Developer Commentary. As you play the game you’ll occasionally get the chance to press a button and hear what Tim Shafer and the others have to say about a given snippet of dialogue, or piece of code, or part of the development process. It really serves to underscore some things you might have missed, or that you have come to take for granted in modern games but were unheard of in 1998. Really time audio processing, for example, or cinematic scoring of specific scenes. The developer commentary really adds a lot to the game if you’re fascinated by the creative process (which I am). Well, it is written by Tim Shafer and it is from the LucasArts era of adventure gaming, so it is funny, clever, heartfelt, and deceivingly deep. 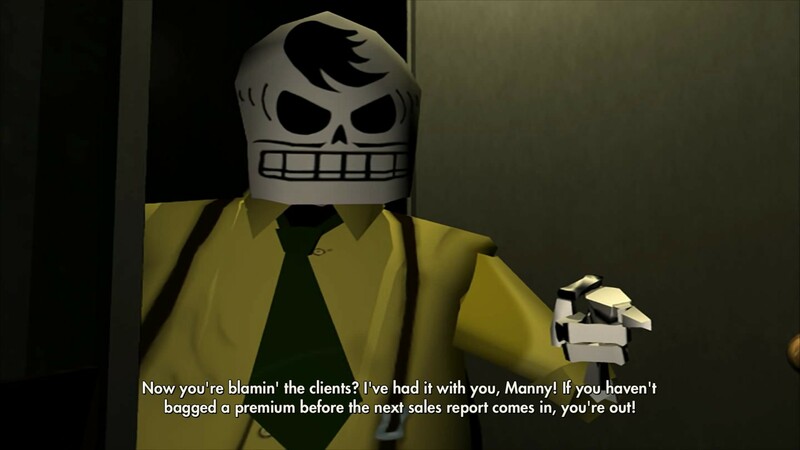 You play as Manny, the Grim Reaper. Well… he’s really a grim reaper, and the afterlife isn’t quite what people might expect. Reapers are essentially travel agents. The ninth level of the afterlife is where you ultimately want to go, and getting there is a long and potentially dangerous journey. However, if you’ve got the scratch, and you lived a good enough life to afford it, then you can buy more luxurious travel accommodations. Manny’s job is to pick you up from the land of the living, and ideally upsell you on something like a car or train ride so he can get a commission and work of his public service debt. Until he does that, he can’t move on to his own reward either. The whole thing is very film noir, with the developers making overt references to the greats of the genre like Casablanca. A love story is interwoven with intrigue and manipulation, with evidence slowly surfacing that suggests there has been some underhanded dealings going on in the underworld. 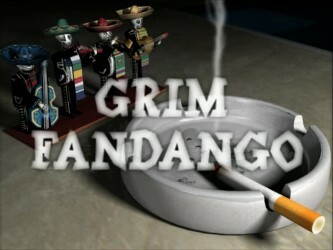 Grim Fandango was and is an expertly crafted game. It shows its years a bit, even after the remastering, and may not be as convenient to play as we’ve come to expect from adventure games, but it remains a masterpiece. If you’ve never played it before, pick it up and enjoy it. If you have played it before, pick it up and enjoy the developer commentary. You really can’t go wrong with this one. 9.0 / 10: A classic of the adventure genre that holds up remarkably well on the strength of its writing and art design.